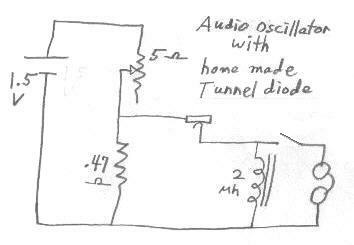 Negative Resistance Oscillator With Homemade Tunnel Diode. I have found that it is easy to make an N type negative resistance device, similar to a tunnel diode, by lightly touching a piece of #28 galvanized steel wire against a piece of aluminum. This project may not be very practical but I find it to be a very exciting experience. When I first heard about tunnel diodes many years ago, they seemed to me, to be one of the most exotic devices on earth. It was very exciting to discover that I could easily make at home, at least in very crude form, an actual working device that is similar. Home made device similar to a tunnel diode and curve produced. N type negative resistance device, made simply by lightly touching the side of some #28 gauge galvanized steel wire to a piece of aluminum. Curve tracer was set at 5ma per division (vertical) and .1 volt per division (horizontal). Notice the peculiar hysterisis like loop at the negative resistance point. The device seems to respond in this way to the wide bias voltage excursions from the curve tracer. This does not seem to be a problem when applying a steady bias from a low impedance dc source. A similar project, but using S type negative resistance instead, was sucessfully done earlier using iron pyrites or a heat treated piece of galvanized sheet metal. The heat treated sheet metal device, being an S type negative resistance device, is much different than the device described here, and operates in a much higher voltage region. I am guessing that the natural zinc oxide layer that forms on the wire may be responsible for the negative resistance of the device described here. The voltage level where the negative resistance happens is fairly consistant and is almost always between 200 and 250 millivolts. The current level where it happens however, can vary widely between 20 and 100 milliamps. This circuit can be easily powered from a 1.5 volt battery. One characteristic of N type negative resistance devices is that they typically require a very low bias source resistance in order to keep the bias voltage stable within the negative resistance region. With too high of bias resistance, the voltage, as it enters the negative resistance region, will have a tendacy to suddenly jump past it. This is why a gap is seen in the curve (see photo). This homemade device, with its narrow negative resistance region, requires an even lower bias source resistance than a typical tunnel diode. A typical tunnel diode can be biased within the negative resistance region with a bias resistance of around 20 ohms. This device works best when the bias resistance is 1 ohm or less. Unlike this N type device, S type negative resistance devices, such as the heat treated galvanized sheet metal device, act in the opposite way and bias stability is best with a higher bias source resistance. This device, like many others that I have been making, has a symmetrical curve in both the positive and negative direction and can work with the battery connected either way. Just for the sake of being consistant, I did most experimenting with the aluminum biased positive with respect to the zinc covered wire. The low (approx 250 millivolt) bias voltage for this device was produced across a .47 ohm resistor, connected to the battery through a 5 ohm pot. This means drawing 500 to 600 milliamps from a 1 1/2 volt battery in order to supply approx 35 ma to the device. 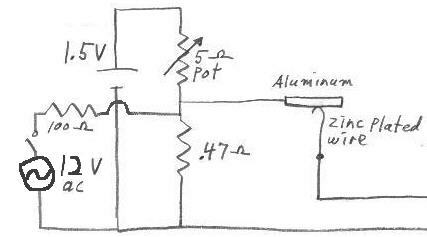 A 5 ohm pot is not as common as a 50 k ohm pot but can be easily obtained at a surplus outlet. 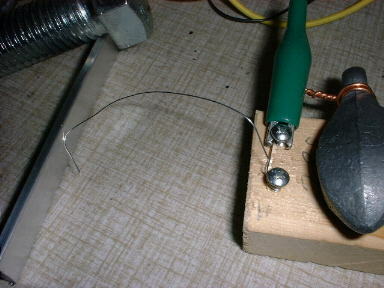 It might also be easy to improvise a 5 ohm pot from something like a pencil lead. It was easy to run the circuit from a single AA cell but of course a D cell is much more suitable when drawing this much current. An emitter follower circuit could be a much more efficient way to bias this device but I like to have this circuit completely void of any commercially made transistors or other active devices. I wanted to be absolutely sure, that this homemade device is indeed what is actually producing the oscillations. Below are schematics and waveform pictures of an LC oscillator and a relaxation oscillator. Negative resistance LC oscillator from homemade tunnel diode. 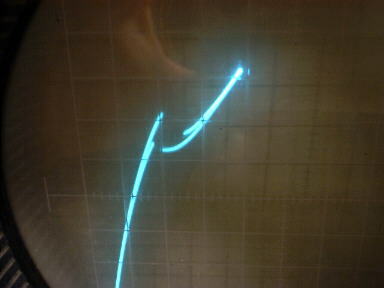 Negative resistance relaxation oscillator from homemade tunnel diode. This relaxation oscillator can be made to run at any frequency from audio to 12 mhz by changing the value of the inductance. A headset of any impedance can be used at audio frequencies to make adjustment easy. The switch can be a key for use as a code practice oscillator. Adjustment of these circuits can be tricky but easily done if things are set up rite. I have had very little success in getting the circuit to oscillate while trying to adjust just the catwhisker with a set bias voltage. The easiest and best way to adjust this circuit is to switch the device out of the circuit and to a curve tracer. Adjust the catwhisker until you observe a negative resistance region, similar to that shown in the picture above, and then switch the device back into the oscillator circuit. The bias pot is then adjusted, looking at an oscilloscope, for a clean oscillation signal. The circuit above, for the sake of reducing clutter, does not show a dpdt switch that I sometimes use to switch the negative resistance device between a curve tracer and the oscillator circuit. A curve tracer is not always a handy thing to have around. The circuit can also be easily adjusted by using just an oscilloscope and a 12 volt transformer, as shown in the partial diagram below. While the normal dc bias is applied and adjusted to approx 200 to 250 millivolts across the .47 ohm resistor, 12 volts ac from a transformer can be switched into the circuit through a 100 to 200 ohm resistor. This applies a varying dc bias to the negative resistance device. The catwhisker can then be adjusted until you see 60 cycle bursts of rf on the scope. If the ac voltage is now switched off, a continuous oscillation can usually be achieved by watching the oscilloscope and adjusting the bias pot. The circuit will then be running entirely from the 1-1/2 volt battery. The audio frequency oscillator can be easily adjusted without an oscilloscope or curve tracer by simply connecting a pair of headphones across the inductor. The temporary application of the 12 volts is still helpful. Using 12v ac to adjust oscillator without the need for a curve tracer. 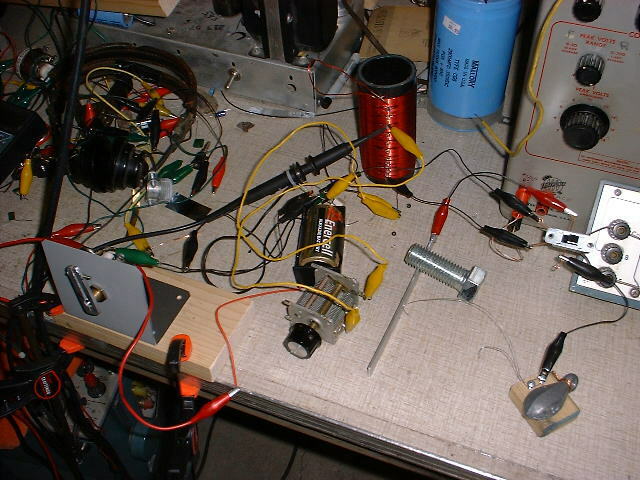 I have had some success in getting the circuit to run without the use of a 12 volt ac source or curve tracer by connecting an analog volt meter (250 mv full scale), across the .47 ohm resistor. With some practice, it is possible to adjust the catwhisker while watching the voltage and then adjust the bias pot until you get oscillations on the oscilloscope. An analog volt meter is usually better than a digital one for applications like this because you need the instant response of the needle while making adjustments. A volt-ohm meter set to read on the 50 microamp scale will usually suffice as a low voltage (around 250 millivolts full scale) dc volt meter. So far, it is easy to get a continuous sine wave signal at 1 mhz. The amplitude of the oscillation is typically between .35 to 1 volt pp. Few things can beat hearing a hetrodyne on a radio receiver that is the result of a homemade active device. With the am broadcast band LC circuit, the signal is usually a nice looking sine wave with the frequency being adjustable across most of the am broadcast band by turning the variable 365 pf capacitor. The coil is 100 turns of .034 dia. enamel covered copper wire on a piece of 1-1/2" abs pipe (1-7/8" outer diameter). Taps were placed at 5, 10, 15, 20, 25, 30, 40, 50, 60, 70, 80, and 90 turns. As shown in the diagram, the very low impedance of the device worked best into the 5 turn tap. The variable capacitor was connected to between 70 and the full 100 turns of the coil. In trying to produce higher frequencies of the order of 7 mhz, I substituted an LC circuit with a smaller inductance coil. While using this higher frequency LC circuit, the long sloppy clip leads used to build the circuit, were a much greater factor in determining the frequency than the LC circuit was. By taking the LC circuit out and substituting it with just varous sized inductors or even just pieces of wire, in series with the negative resistance device, a relaxation oscillator was made. This relaxation oscillator could be made to run anywhere from audio frequencies to (with careful coaxing) 12 mhz, depending on the size of the inductance in the circuit. The higher frequencies were produced just by putting various lengths of the wire in series with the device. The only limitation on the lowest frequencies attainable with this relaxation oscillator, seems to be the internal resistance of the inductor. Big inductors tend to use more wire and thus have a higher resistance. With this circuit requiring such a low bias resistance, one ohm is close to the maximum internal resistance that is usable in an inductor. The inductor for audio frequencies should therefore be made with as few turns as possible and as large diameter of wire possible into a toroid core with a high permeability. A typical inductance for attaining audio frequencies with the above relaxation oscillator, is 2 mh. The negative resistance part of the curve can form at many different current levels. With the relaxation oscillator, negative resistance at higher current levels seemed to produce lower frequencies. This is probably because the overall resistance across the inductor, is lower when the negative resistance is at a higher current level. A good catwhisker arrangement can be made by putting two screws into a piece of wood about 1-1/2" square near the edge. A piece of #28 gauge galvanized steel wire can be wrapped around the two screws and cut to about 4 to 6 inches in length. A heavy weight on the block will make its position stable after making adjustments. This N type negative resistance device worked well by bending the tip of the wire around so that the zinc plated side of the wire, instead of the tip, touches the aluminum. Several different pieces of zinc from different sources, in addition to the galvanized wire, were tried and they all seemed to work for making the negative resistance. I also had success using different pieces of aluminum from different sources. None of the pieces of aluminum were anodized. I was even able to get the circuit to work after buffing the aluminum and galvanized wire with a piece of "Scotchbright" like material. No special treatment or heating needed to be done to either the zinc or aluminum. The aluminum and the galvanized steel wire were used in their original condition. Homemade tunnel diode and oscillator circuit setup on table. Negative resistance oscillator circuit can be seen in the foreground. Notice the dpdt slide switch used to switch the negative resistance device between the curve tracer (right of picture) and the oscillator circuit. The extra stuff in the background is not part of this project. A crude knob had to be improvised from a piece of aluminum in order to easily turn the 5 ohm pot which had only a screwdriver slotted shaft less than 1/8" long.